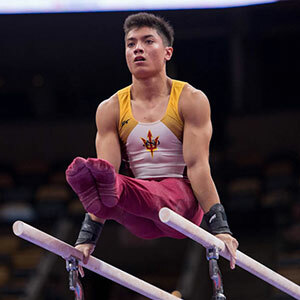 2018 U.S. junior 17-18 all-around champion Brandon Briones of Gilbert, Ariz./Aspire Kids Sports Center, earned the U.S. men’s gymnastics berth for the Summer Youth Olympic Games Buenos Aires 2018, Oct. 6-18, in Buenos Aires, Argentina, pending approval of the U.S. Olympic Committee. Justin Ah Chow of Miami/Universal Gymnastics, is the alternate. Rob Survick with Aspire Kids Sports Center is the men’s gymnastics coach for the Youth Olympic Games. Briones joins two additional U.S. athletes who will compete in the Youth Olympic Games: Elizabeth Kapitonova of Staten Island, N.Y./Isadora Rhythmic Gymnastics, rhythmic gymnastics; and Alyssa Oh of Rocklin, Calif./World Elite Gymnastics, women’s trampoline.